"Forstner bits, named after their inventor, Benjamin Forstner, bore precise, flat-bottomed holes in wood, in any orientation with respect to the wood grain. They can cut on the edge of a block of wood, and can cut overlapping holes. Because of the flat bottom to the hole, they are useful for drilling through veneer already glued to add an inlay. They require great force to push them into the material, so are normally used in drill presses or lathes rather than in portable drills. Unlike most other types of drill bits, they are not practical to use as hand tools." While Wikipedia is a little skeptical, I've found these bits to work really well with handheld drills. and you've got a basic countersunk bolt. perfect fit, neat, professional looking, strong. Love those forstner bits. Don't like that they're about $30, but they last for years. I like them a lot better than hole saws. I'm still getting used to the size of this farm. The two bins (the big tubes on the right in the picture above) can each hold about 18 tons of grain. 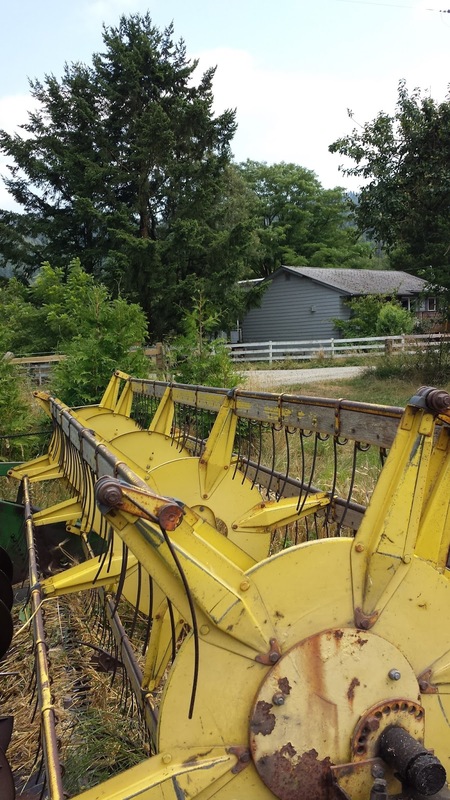 I purchased 14.5 tons, and I used my tractor and a grain elevator that the combine operator provided and up it goes. The fellow in the blue shirt is Andrew Albert, who does quite a bit of farming in this area. His business, Andrews hay, makes most of its money by leasing farmland and growing things, and doing the odd bit of custom tractor work here and there. 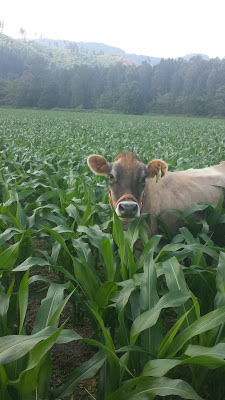 He's the one who leased my ground for corn this year; and the corn looks great. It's 10 to 11 feet tall and just starting to tassel out. Amazing stuff. Can almost see it grow. This wheat is soft white wheat, which is commonly used for bread flour. If civilization ended tomorrow I'd have enough wheat to make something like 25,000 loaves of bread. 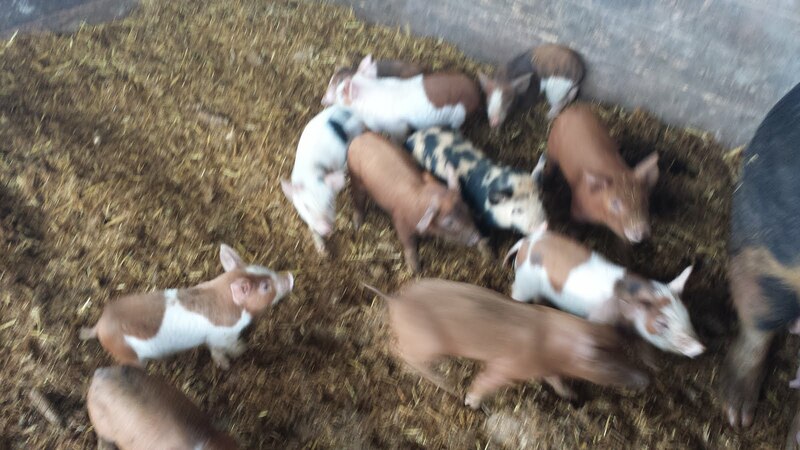 The pig on the left decided that wheat was pretty tasty; stole mouthfuls of spilled wheat. His yield off the neighbors field is somewhere between 2000 and 3000lbs per acre (1 to 1.5 tons); I'm very interested in small grain production as a crop rotation, with the end use being animal feed, or potentially human food. 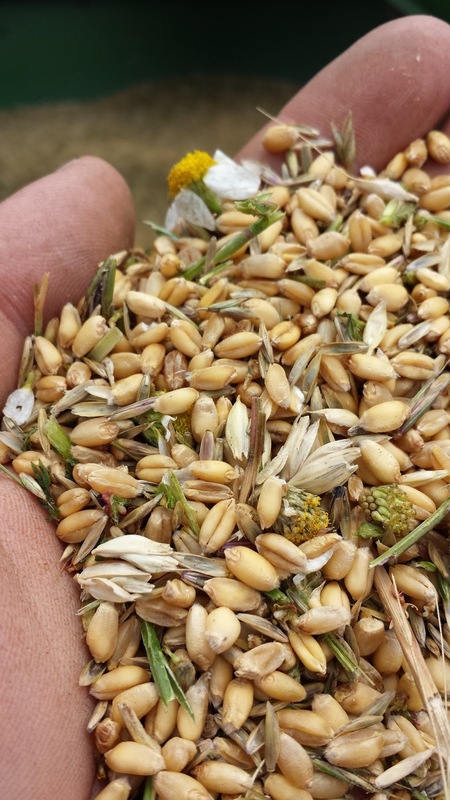 The wsu small grains seminar talked a lot about barley being raised for local beer production. Having bulk wheat like this is interesting for several purposes: It's a cheap cover crop if I desired it. Figure between $15 and $20 an acre (150lbs/acre application rate). That's really cheap. 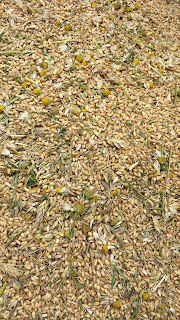 Animal feed; less than half the cost of prepared feed, and you can feed it directly to chickens or turkeys; no processing. Stable feed costs -- I know exactly what my feed will cost for the span that I use this -- easier to set prices. This is the low-tech way of doing a commodity future of sorts. Local feed/food. Like, REALLY local! The field across the road from my farm is being combined today; it's planted in some variety of winter wheat; couldn't tell you which kind. This wheat is mostly purchased by a local chicken producer; it's a part of the feed that they use to feed their broiler chickens, and... hey, wait. If I buy direct from the farmer, instead of buying from the mill who gets it from the farmer, I can save about 30%! So a little haggling standing on the ladder to the cab, and we arrive at a price that we are both happy with, and they'll be putting 18 tons of it into my bins later today. 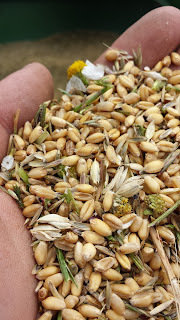 Wheat by itself isn't a complete ration, and in order to get the best value out of it I'll have to do something to make it more palatable to pigs; soak it, or grind it, but it can be fed directly to chickens and turkeys - their gizzards grind it up for them. 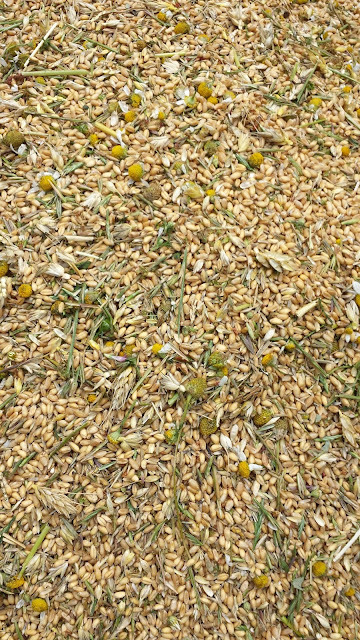 This grain isn't screened; it's got a fair bit of weeds and debris in it still, but the price is right; less than half the equivalent price of feed. And I've already got tons of soybean flour. Sounds like I have the basis for a ration. 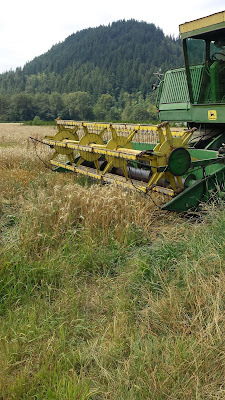 Note: This is the combining from the edge of the field where there were some weeds and flowers and stuff; in the main parts of the field it's much cleaner; that's where mine will come from. I'm feeling a bit scattered this year; the biggest thing that disrupted my usual farming calendar was the purchase of the new farm. I made the offer in December, but we didn't actually close until May, and it wasn't clear until about a week before close that we would close. Now normally that wouldn't make much difference, but the late winter and early spring is the time when I usually firm up the plans for the coming year, and, in the case of things like turkeys and chickens, place my orders for the chicks and poults that I'd raise for the coming years production. It's interesting, but I feel like I've regressed a bit in my farming. One step forward, two back. I say this because my original farm was pretty much built out to be useful for my operations. For the first 7 years there I spent the time building stuff, and I'd actually gotten it pretty much completely built out. custom built, if you will. So I've been spending my time replacing the things that I'd built on the other farm. This one will be great when I'm done, but right now I've got a punch list that I'm working down, one item at a time. The simplest thing, a good perimeter fence, is going up now. I've regressed to the place I was in the first year or so of my farming venture, where I could not reliably keep animals on the property. It's a lot of work, but no matter how much work, a good fence is well worth the effort. So as I work through the fencing project, as each portion of the fence is complete, I've been doing all of the improvements so that I can mark the newly fenced area off as "complete". Things like water lines and gates, animal shelters and electrical. So I was working on the area around the well that supplies the water to the property. It's an artesian well, and the water bubbles out of the well casing if it's not being drawn by the well pump, naturally. I'm there because I fixed the water line leaks (by replacing the water line between the wellhouse and the barn), and this actually caused a problem; the water system doesn't leak, but all of the water that use to leak out of the water supply lines now pours out of the well, and it's making my backyard into a small pond. 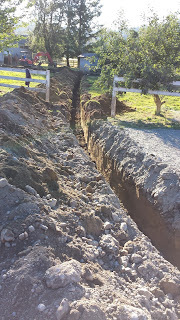 So I'm working on putting in a small catch basin and drain line, to direct the water that is pouring from the well, and in doing so I forgot that the power line to the wellhouse was buried 6 inches or so under the ground, and cut it. I knew it was there, and I had it marked, but I forgot that day. So now my project becomes repairing the well house power supply. 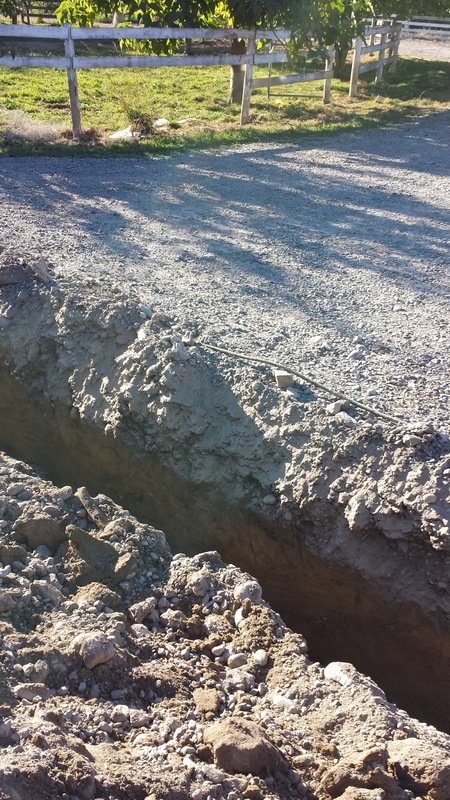 So I dig out the trench, get the conduit and power line, and run the new power line across the yard, only to find that I hit some sort of drain that wasn't marked. close to the end of the powerline run. It's a 3" line, plastic, hard to detect. No idea where it goes. So my project then becomes trying to figure out what the drain line was from, and whether I need to repair it too. So I'll get up tomorrow, and figure out the drain, and repair it or not, then I'll figure out the wellhouse power supply, and fix it, and then I'll start work on the catch basin that I started working on today. Unless something else happens to come up while I'm working on one of these other things. Oh; this all happens with the normal backdrop of farming activities; milking two cows, 60 piglets farrowed, working on the sweet corn weeding and then my other full-time job, whatever that is. I forgot. Been a busy month. I didn't know that this area was a hotbed of outdoor concerts and events at this time of year. Just across the river I can clearly here the amplified music from the burning beast BBQ, with its 400+ guests. Earlier today I was witness to a parade of innertubes and canoes and all sorts of floating contraptions on the river that I have frontage on; I'd guess that I saw something like 500 people float by. No idea that this stretch of river was this popular. Yesterday I had to fish out three exhausted innertubers out of my corn field. They made their own corn maze, and finally called a friend to come and get them when they couldn't figure out how to get out of it. Generally speaking I'm fairly liberal about granting permission to those who ask to cross my land; "don't walk in the corn" or "stay to the left of the pigs" -- that sort of stuff. Keep the gates closed if you find them closed, leave them open if you find them open... Country rules, but ones that folks from the city may not know. I can never tell what people will be interested in when I write what I do. You, dear reader, have been more interested in fencing than any recent post I've done. I've gotten questions via email and postings, and I'll do my best to answer them here. Q: Why 8 strand fence? People use less strands of fencing elsewhere. 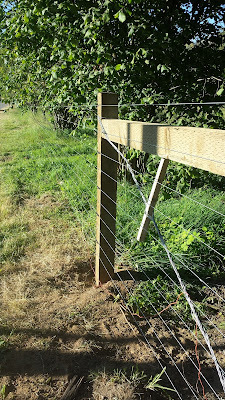 Each species of animal has a different type of fencing that works best; different height, different spacing of wires. With pigs a standard 34" hog panel works most of the time; pigs never jump; they work more like bulldozers, pushing right through with four wheel drive and massive power. They are most deterred by fencing that is at their nose height, and with different size pigs there are a number of heights. So a close spaced set of wires at the bottom works best. The bottom wire is 4" off the ground, and they're spaced at 5 inches apart for the next few wires. That's the pig portion of the fence. With sheep, you don't need a heavy duty fence, but they can jump. 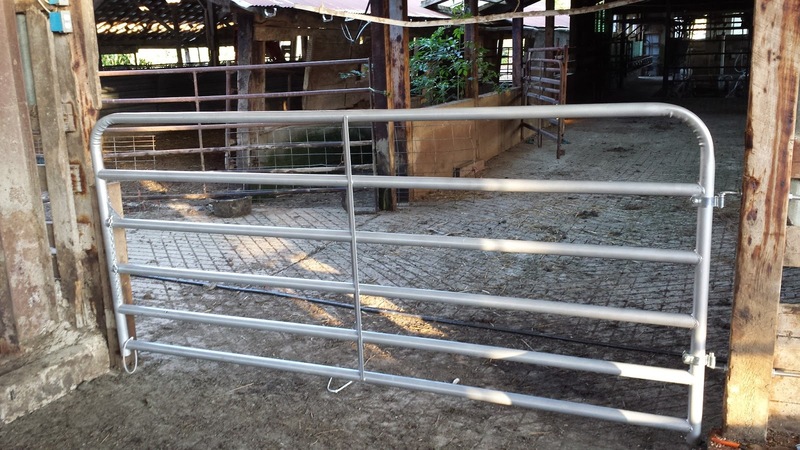 A standard 34" hog panel does not contain a sheep, but a 60" cattle panel does. So you need higher wires, but they can be farther apart, too. So the top wires on this fence are 9" or more apart, and the total height of the fence is about 60". The cows I have are a large-framed breed; I have some Holsteins, and one of my cows stands about 6' tall at the shoulder; she is a very big girl. About 1400lbs. A Holstein that size considers a 48" fence to be a roadbump. She'll walk up to it and keep paddling until she gets a leg over, and then continue walking over it. Field fences don't work with Holsteins, in my experience. Another reason for a 60" fence. Outside the fence are a lot of coyotes. I know that they'll get through the fence - they will probably dig under it eventually -- but in doing so they'll tell me where they're entering and leaving, and I can easily control them. I'd rather not kill the coyotes, although I've shot my share of them. It's not because I'm a softie about coyotes; I've just found it better and easier if I can do what I can to give the coyotes a non-lethal lesson and avoid livestock-coyote conflicts where I can. the other thing that exists around here in quantity are both deer and elk. Both travel up and down the valley and a single deer can wipe out your garden or landscaping. 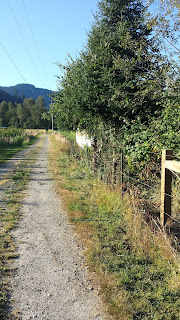 This fence won't stop a determined deer or elk -- they can jump over it -- but it's less work for them to walk around, and there's corridors on both sides of my property so they can easily move up and down the valley as they choose. Again, choosing to avoid conflicts with wildlife. Plus the additional strands aren't that much more money. 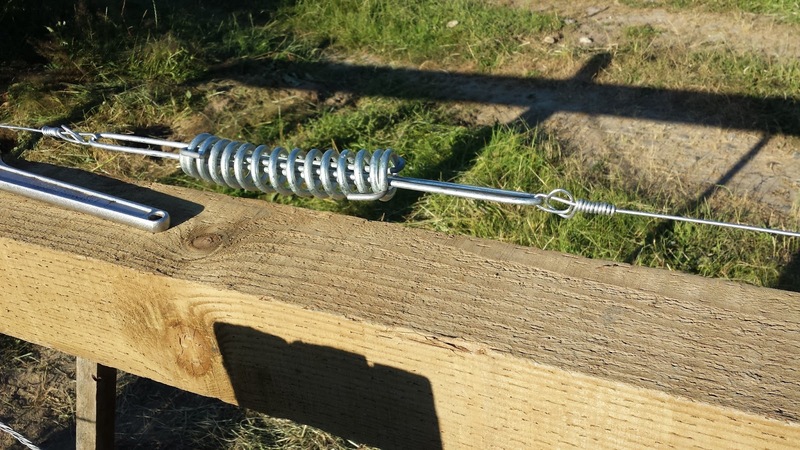 Q: How do you stop the electric fence from contacting wood and shorting out? 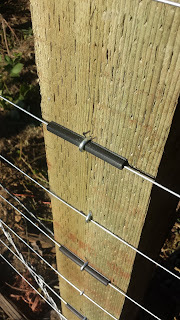 For the electric lines as they cross a post there are plastic tubes that cost about a dime that you slip over the wire and tack down. The picture above shows three of them. 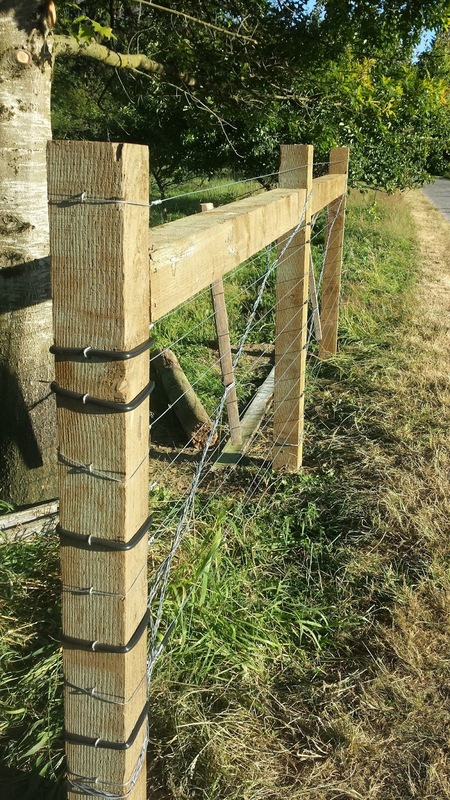 At the posts at the end of a run there are longer plastic tubs that slip over the wire and around the post and insulate it from contact there. Pictures of those tubes below. This is the simple end of the fence; the spring/pulleys are at the other end. Q: What are your costs, installed? The longer the run, the less cost per foot. What costs money are the braces on either end and the hardware to tension the wires, and the labor to put it all together. Wire: $129 for 4,000', or $0.032 (three point two cents) per foot. You need about 40' of wire to connect it all together and allow for wastage, so about $1.20 in wire. 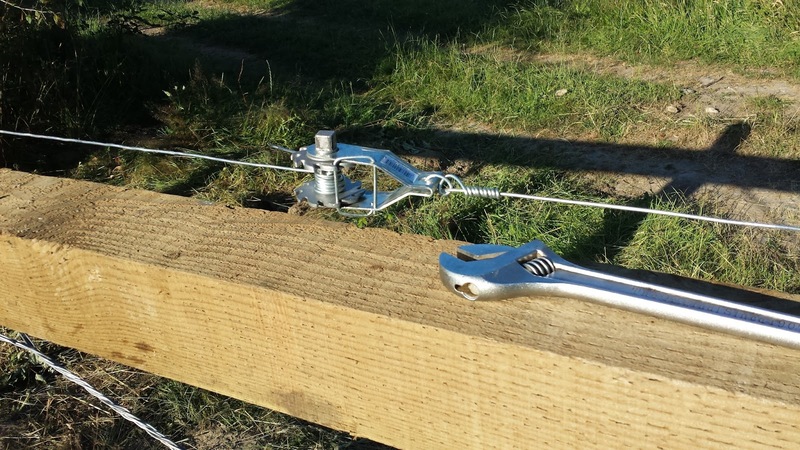 the braces I'm using are 5 ground contact 6x6 posts, 8' lengths, at $32.00 each. Nails and bracing wire add another $8. 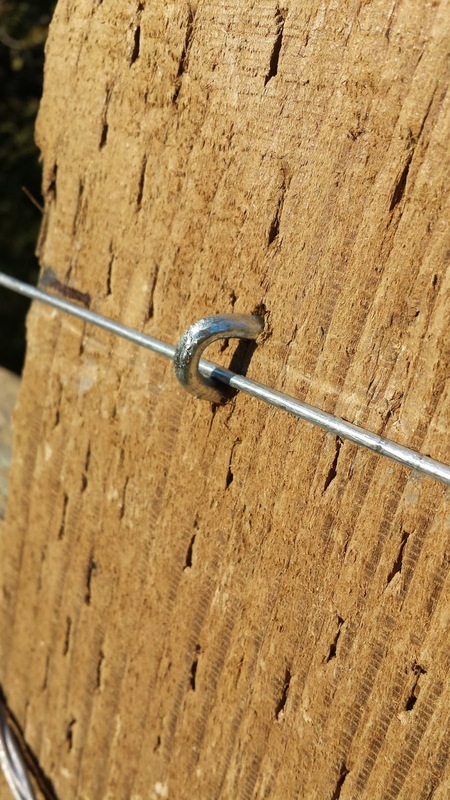 I use 12.5 gauge barbless barbed wire for the diagonal bracing. Total cost per brace (two per span) $168.00, or $336.00. Add $27 if you cement posts in. It takes about 5 hours of labor to assemble the spring-and-pulley system. It takes about 2 hours to actually run the wires and stretch them. Call it 12 hours labor for each span. At WA state minimum wage that'd add $108 or so per span. The brace and tensioning are fixed costs. for an 8 strand 300' long fence it would increase the cost by $126.00, to $561, or $1.87/foot materials cost. For a 500 foot span of 8 wires you'd be looking at $573.6 or $1.14 a foot, materials cost. the longer the span you can run between braces, the cheaper per foot. the wire is not the expensive part of the fence. I've left out one element. 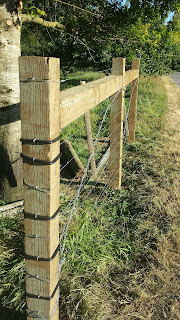 You'll probably want a couple of field posts along the span to support the wire and keep the spacing correct. They don't have to be very big or sturdy; I'll probably use 4" treated round poles, but for my fence it looks like I can put them in at 100' intervals and get the results I need. Some folks like them closer, up to you. Figure $7 per post or so. It takes a while to tie up all of the pulleys and springs. So in keeping animals there's something that will wake me from a deep sleep with chills. It usually starts with a phone call, but it doesn't end there. "Hi Bruce. This is Cora, your neighbor. Your cows are out!" "Uh, thanks. I'll go get them"
You can substitute pigs or sheep for cows, and it has the same effect. Having a good fence allows me to sleep at night, and a good perimeter fence takes part of the panic when an animal gets out of its pen. A good fence is right at the top of the list of things I do when I've bought a new piece of land or a new farm. The new farm is the largest area I've ever thought about fencing, and because of the sheer number of feet of fencing required, I've had to sit down and pencil out fencing costs. Don't get me wrong here: I'm not interested in a cheap fence, or an easy to construct fence, I'm interested in a fence that will be serviceable for 10 to 20 years, is relatively easy to maintain, and has the lowest cost for the function that I'd like to put it to, in about that order. The traditional fence for large acreage is a barbed wire fence. 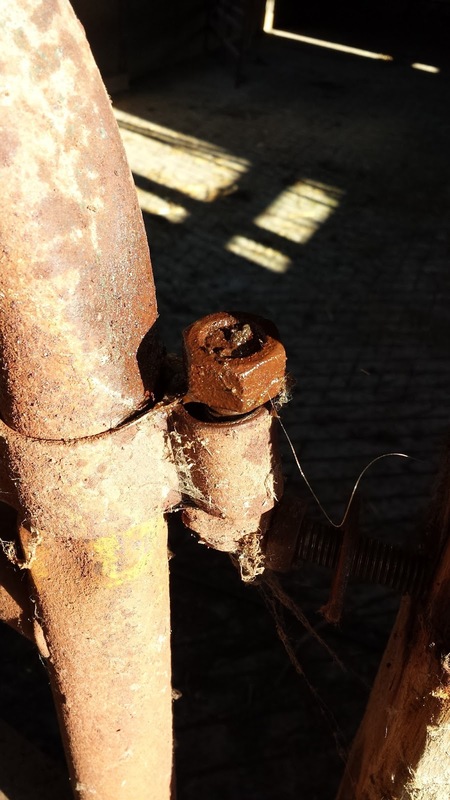 There is a barbed wire fence around parts of this property, but it's in poor condition and it's not much more work to just replace than it is to repair. It's also sized for cattle, which means that it doesn't work for pigs or sheep, and it doesn't do anything to exclude predators. 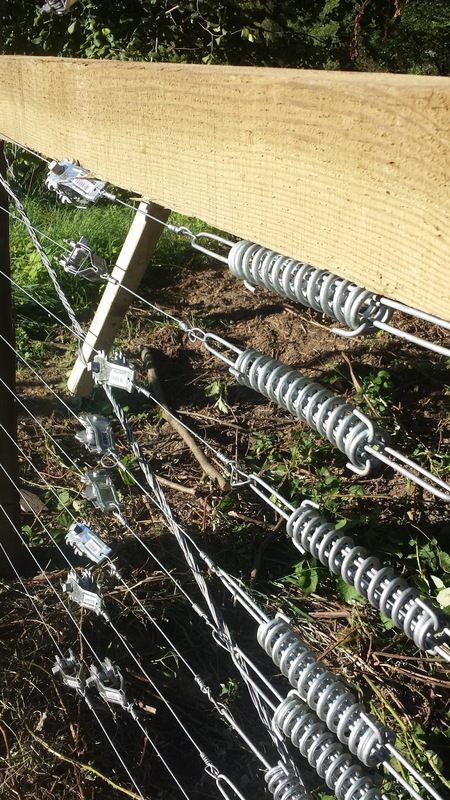 High-tensile fencing is a very strong wire that is stretched tightly between braces. Between the braces there is a field pole every 30 to 100 feet, and you can either use the fence with or without electricity. 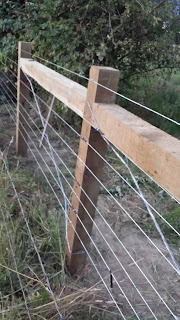 I'm constructing an 8 strand fence with alternating strands of grounded wire and electric wire. 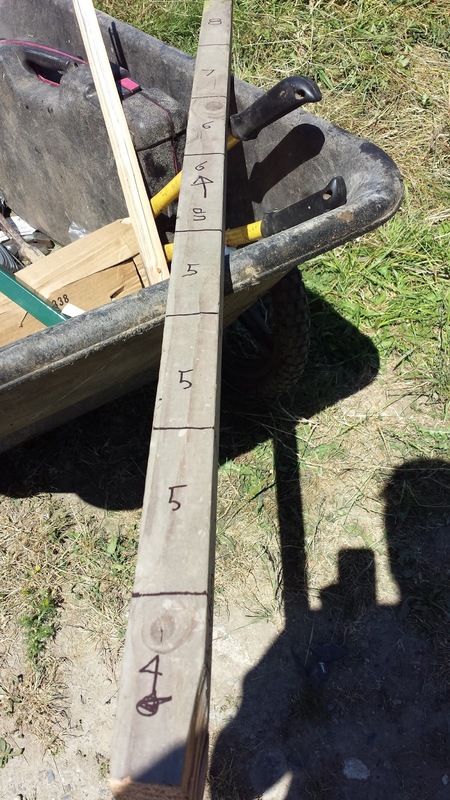 This is the story pole for this fencing project. It marks the locations of the wire and which strands are electric and which are not, and is designed to be used from the top of the brace poles. 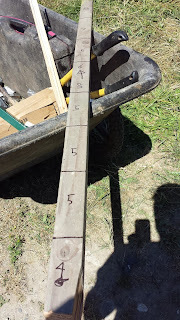 I've nailed a scrap of wood to the top so that you just hang it from the brace while you transfer the markings to the poles. 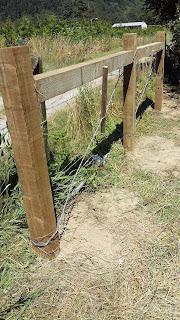 Each of the 8 strands of fencing are tensioned to 250lbs, which means that we need a strong brace to hold up against the 2,000 pound static pull that the fence will put on this brace, and the brace needs to be strong enough to withstand the force if an animal runs into the fencing full-tilt. Each wire has a breaking strength of about 1600 pounds, and with 8 of them in play, that's a potential force of 12,800lbs. So for the braces I've chosen pressure treated 6x6 posts. They're buried 3 feet into the ground. Some are tamped in, some are cemented in, depending on how firm the ground is. Each brace is braced diagonally with wire - a single diagonal brace if the force is from one direction only, an X brace if the pull is from two directions. 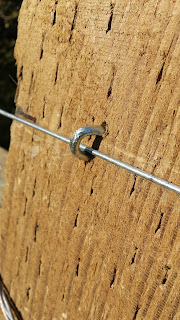 The brace wire is notched into the post with a chainsaw so that it doesn't slip. People claim you need one of these braces for every 400 to 650' of fence run. This particular brace is at the end of a 435' run. This wire is particularly prone to breaking if it has even a single kink in it. 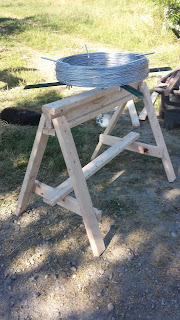 I purchased the jenny kit to unspool it, and then built the sawhorse to hold it up while we unspooled it. The cheap simple sawhorse has been super useful over the years. Each strand is tied to the post at the far end, and then tensioned from this end. The tension ratchets come in two flavors; I chose this one that's $0.50 more expensive because it comes with a square lug on it that allows me to use standard tools to tighten it. The cheaper one required me to buy a special handle, which I always loose. I don't need any more special tools; well worth the $4 more per brace ($0.50 more for 8 ratchets) for the better ratchet. Each strand also gets a spring. This allows the line to flex in case of impact, and also allows you to measure the strain on each strand as you tension it. You measure the length of the coil with a tape measure. It starts out 9" long, and is 7.5" long when the fence is under 250lbs of tension. I used that big crescent wrench to tighten it as it fit over the square drive sprocket easily, and gave me enough lever-arm to make the tightening easy. 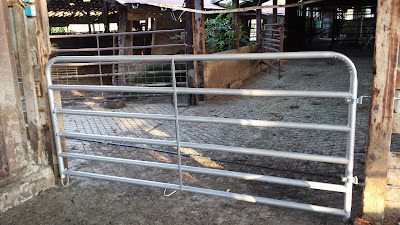 The fence stables are there to guide the wire; you want it to be able to move back and forth, and you also don't want to nick or otherwise damage the wire, creating a weak spot. This particular run goes from the brace at right to the telephone pole you see in the distance in the photo above. Here's the finished product. The top wire is a ground, and is grounded with grounding stakes at either end of this fence run, for lightning protection. The electrified strands are equipped with insulators, and the whole thing is super tight. The barbed wire fence that I'm replacing is in the foreground on the left in the picture above. I'm moving the fence 3' so that there's clearance around the electrical utility poles. I don't want the line crew to damage my fence if they need to do maintenance on the poles at some point in the future. The original fence was stapled to the utility poles. Bad practice. I mounted the spring and tensioners at the house-end of the strands so that it would be easy to see and adjust the strands with a short walk. if one is broken or loose the adjustment point is close in and can be fixed with a couple of minutes of work. For other runs I'll have to walk to them, but I've been working on having all of the adjustment areas as close to each other as I can. The electrical part will join this fence via a trench from the house. 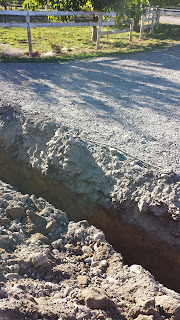 I'll use some 1" water line scrap that I have from the water project as a protective pipe for the electrical line. Inside that protective pipe will go the insulated hot fence wire. Burying the supply lines means that there's nothing to get caught if you bring something tall through the gate, and that you can locate your fence chargers someplace easy to get to and maintain instead of on random fence posts. 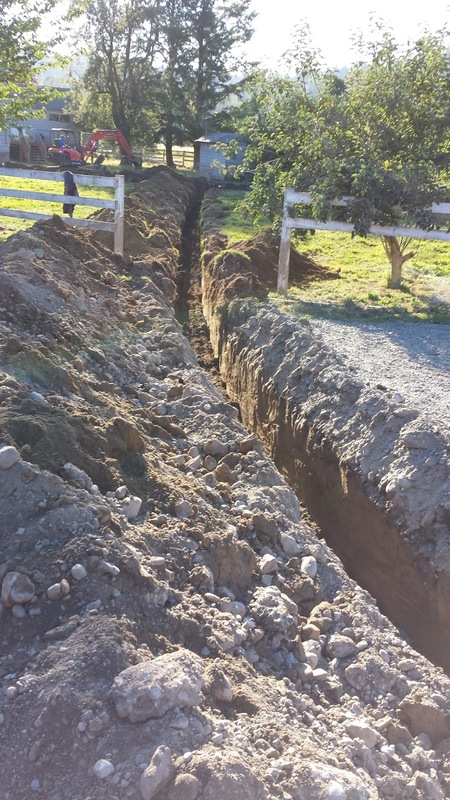 It'll go underground near the house, travel underground to the fence post and then be attached. I'm not sure whether I'll equip each fence run with a cut-off device. 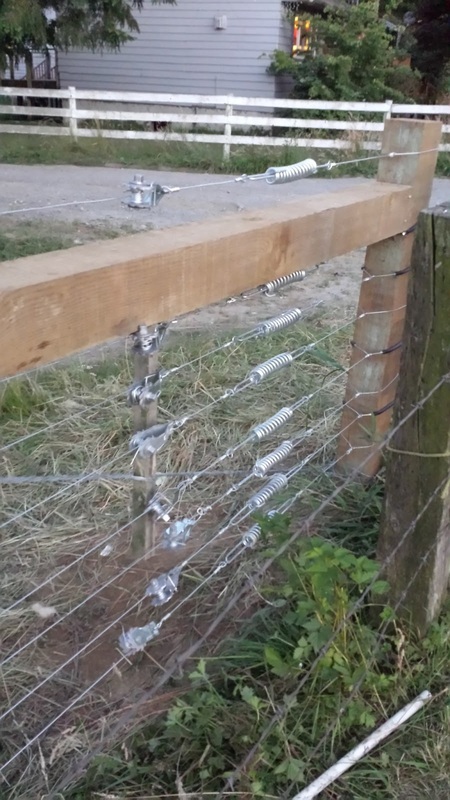 On the one hand it's nice to be able to turn on or off fencing for a given section, but on the other hand it's something that can either break or be left off, or have an animal or person disable. Given that the high-tensile fence is still a viable fence even with power off, I'll probably just set it up so that each charger charges a particularly area and I'll turn it on or off from the house. It's taken me a while to write this entry because I got so much out of the presentation that WSU put on about raising small grains for both human and animal consumption. My basic interest in this is the ability to grow more of the feed and more types of food for both humans and livestock. With the new farm, I've got enough land that I could actually raise quite a bit of grain if I chose; and having some sort of crop rotation seems like a very good idea if I'd like to increase the fertility of the land and reduce crop-related pests. 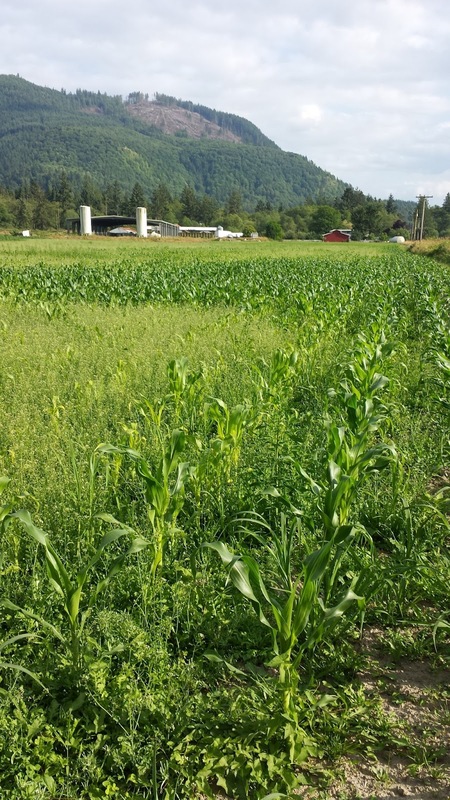 I am not the only one who thinks that growing grains and forage is a good idea. I'd guess that this field session was attended by about 400 people. They had samples from their bread lab, which I'll take about in another post. The bread lab is cool all by itself. For the presentation they'd labeled each grain, so you could clearly see the characteristics of each type. They had 42,000. (Forty two THOUSAND) types of grain growing at this facility this year. Forty thousand types of grain. Who knew? The tag on the right is particularly interesting to me. So land about 20 miles away from me, in the same sort of soil and with the same weather patterns, produced over 3 tons of grain per acre. 3 tons of grain would feed a sow and piglets for roughly 2 years. This sort of number gives me an idea of how many acres I'd have to devote to grow all of the feed for my pigs. Yes, you nutritionists out there, I'm ignoring the fact that it's really, really hard to grow protein in vegetable form around here. 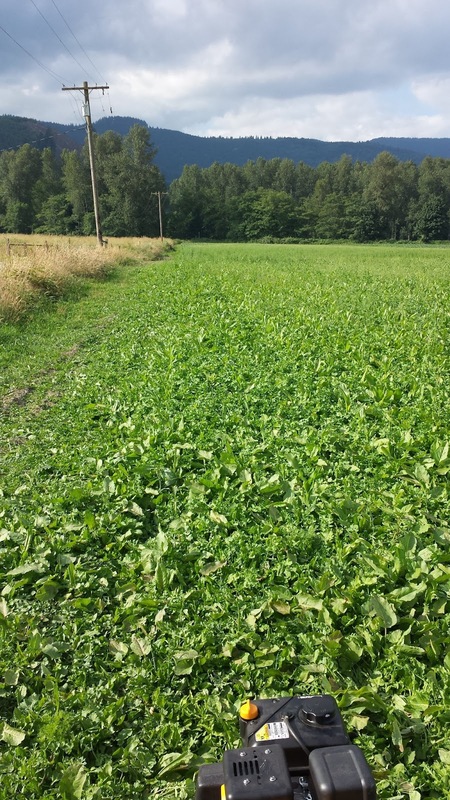 This is a potato experiment that is looking at the effect of crop rotation and compost and standard fertilizer on potato yields. They're also looking at biosolids (treated sewage by-product) to see how it grows crops. Not a big fan of biosolids, but that's what manure is, too. 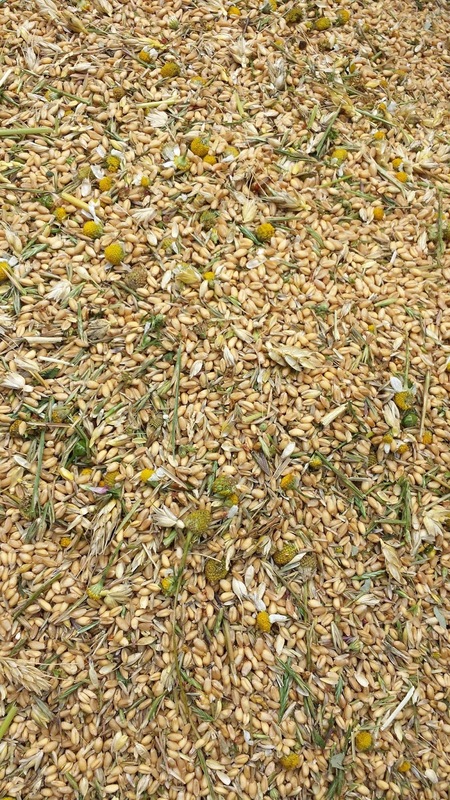 This variety of grain was both high-yielding and was voted as best tasting. Andrew Corbin is a researcher who planted alfalfa in the fall of last year, 7 varieties and has been tracking growth and production since. he's standing in his alfalfa field which has already had a first cutting and is about to be cut for a second time. 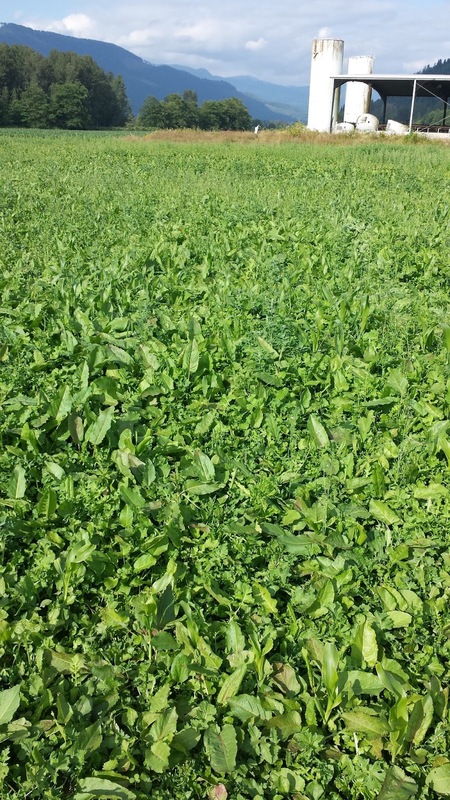 This is REALLY exciting to me, as alfalfa is the single largest expense when you're forage feeding dairy cows. I was really glad to see his presentation, and its given me 7 varieties to choose from for my own field tests. Thank you Andrew! Thank you! The handout that Andrew had prepared has several graphs of yields, growth, plant date, tested forage values and so on for each type of alfalfa. 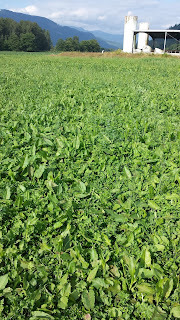 I'm looking for a seeder now and looking forward to trying some alfalfa of my own! Why would you work this hard? So I've had a plague of pigs running around; every day there were a few pigs that got out and did various things, like eat the chicken food or get into the corn field, and I couldn't figure out how they were getting out. They'd trot back to their pen at the end of the day and I'd let them in. Maybe cow proof. Not pig proof. This is NOT my preferred way to stop the gate from being lifted off the hinges. Just sprayed it with WD40; it was rusted solid. The way that these gates are mounted, all of them, allow them to be picked up off their hinges with a straight lift. Now cows might not do a straight lift, but that's what pigs are best at. A pig will insert her nose into the gate, raise her head, and the whole gate comes crashing down. The pig waits for the noise to die down, and then walks out to do whatever she wants. Now the previous owners weren't completely oblivious to this, so on some of the hinges they drilled holes and inserted a pin, or actually threaded the top of the hinge pin and put a nut on, as shown in the picture above. 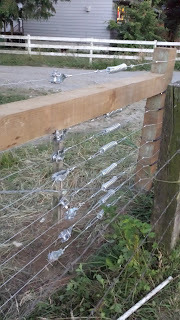 Some of the gates have pins holding them in, some are welded, some have nothing, some have the nuts. It's a lot of work, time and effort, when all you have to do is install the gate as shown in the last picture. 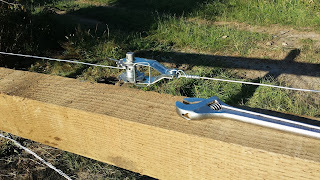 I can take that gate off the hinges too -- you loosen the bracket clamped to the gate and just slide it up or down. Simple, easy, and you don't get surprise visits from your livestock. Just a note: I'm about as cheap as you get. I hate spending money unless there's a really good reason. 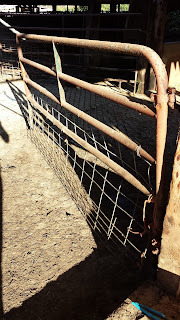 but I buy the heavy duty gates because I've had pigs and cows walk through the lighter grade stuff. 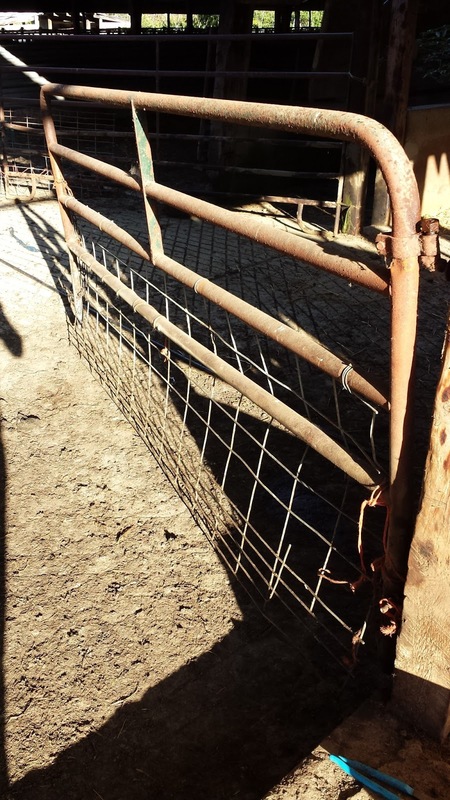 It's not a savings to buy a lightweight gate if your average livestock weighs 400lbs or more. This is just plain bad. 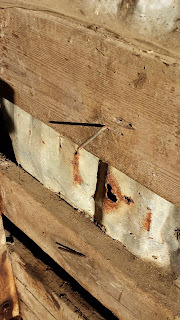 There are a lot of nails sticking out of this wall, a good 25 or 30 of them, they're all sharp and rusty, and they're sticking into the animal part of the barn. Any one of them is a puncture wound and infection waiting to happen for both man and beast. So I set aside my gate work for a few minutes and use a grinder to grind all of the nails flush with the boards. This place held 400 cows as recently as 3 years ago; these nails were here then, too. I'm a little astonished. You don't need this type of problem when you keep any kind of animal - if nothing else it just adds to your workload. Little emergencies all day. Who needs that? It's been this sort of stuff that's been my primary focus for the last two weeks. As soon as I have the animals secure I'll start working on the perimeter fencing, which really is a big part of being able to sleep at night, and have peaceful relations with the neighbors. 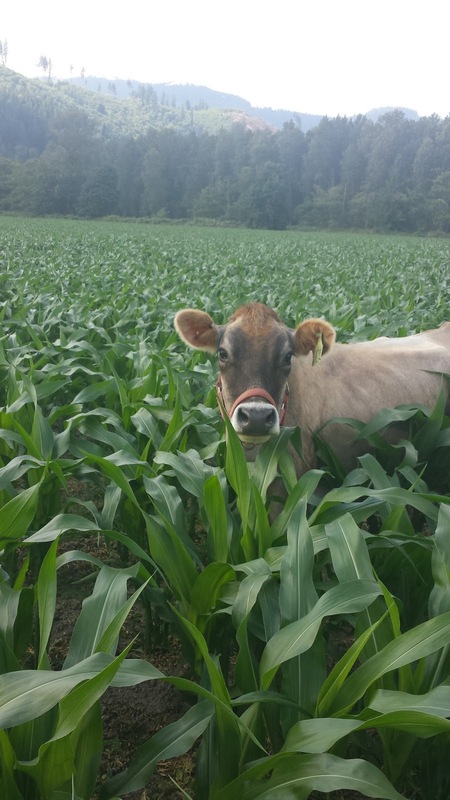 I have two corn crops on my land this year; a conventionally managed crop of cow corn, destined to be chopped up for corn silage, and the other is a crop of sweet corn I put in to see how it would do, mostly. The silage corn is a crop put in by a local farmer who leased the ground for me for this season. I've been watching his technique for putting in the corn and the steps he takes to manage it. How many passes with a tractor, which implements, and the rough timing of when things were done and what was done. 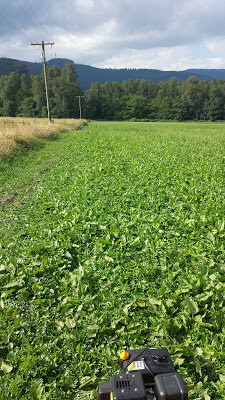 After planting, it was sprayed down with an herbicide which killed nearly all the weeds. You can't see it, but below that sea of green it's pretty much weed free. Contrast that to the sweet corn, which cannot be sprayed. The picture below is the sweet corn field. Having trouble seeing the corn? So am I. So I'm running a walk-behind cultivator between the rows to weed them. Each row is about 900' long, so it takes a few hours every day to get every row. 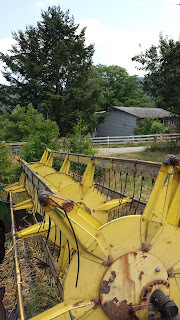 This mechanical tilling removes the weeds in between the rows of corn, but doesn't remove the weeds in the corn row itself -- that's something I'm going to have to do by hand. My new hobby. 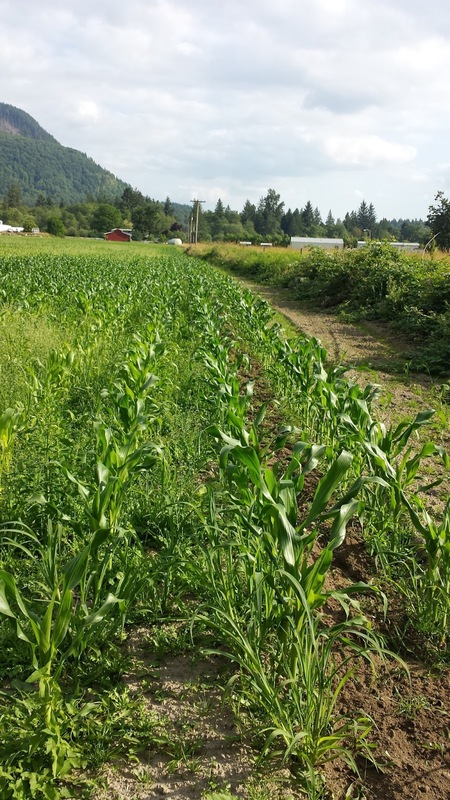 Some parts of the field have had different experiences -- the corn managed to outgrow the weeds, mostly by luck. The majority of the field has so many millions of seeds in it that anytime the ground is tilled and the weather is right, hundreds of thousands of plants will sprout and grow. 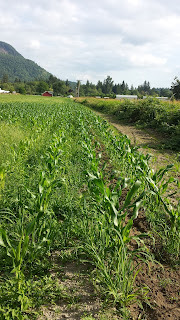 If I grow sweet corn in any quantity I've got to figure out what the big growers use for cultivation. There has to be a better way.